"Chances are you have already seen the movie “Big” when you were a kid. The Tom Hanks fantasy comedy was part of a lot of children’s’ lives in the late 1980’s. You might also fondly remember that classic scene where Hank’s character, Josh, danced with Robert Loggia atop a huge piano mat playing chopsticks. Wouldn’t it be cool to have one of those huge piano mats at home for your kids (or for yourself)? Well, actually you can buy piano mats now without needing to pay an exuberant amount of cash. There are piano mats available today that are made for both kids and adults. While they may not be as big, pardon the pun, as the piano mat used in the movie “Big”; they nonetheless offer the same amount of fun." This durable piano mat by Kidzlane is one of the most feature-rich mats out there. In fact, it comes with 4 whole modes – play mode, record mode, playback mode, and demo mode. I’ve found these different modes really get kids to enjoy using the mat more and for longer periods of time – while they might get bored fast just jumping up and down on a normal piano mat, it’s much cooler to be able to record yourself and play back the “song” you’ve just made! The mat also comes with 10 different sound options (guitar, piano, clarinet, trumpet, saxophone, violin, banjo, accordion, harp, and xylophone), as well as 17 keyboard keys to really round out the musical experience with some variety and the potential to do much more than just play chopsticks using a baby grand piano sound. This mat is perfect for any kid age 2+, and really aims to help stimulate a deep interest in learning how to play music on a “real” instrument when older. 4 MODES: Play, Record, Playback, Demo-mode with 7 prerecorded songs. 10 MUSICAL INSTRUMENT SOUNDS: Select from Guitar, Piano, Clarinet, Trumpet, Saxophone, Violin, Banjo, Accordion, Harp, and Xylophone. FEATURES AND SETTINGS: 17 black and white keyboard keys, Adjustable volume, Automatic "power off" system, 3 replaceable AA batteries included. This piano matt by Rhode Island Novelty is one of the larger commercially available mats out there. It comes with a whopping 24 keys and 8 different instrument sounds, so you and your kids can really get creative with the type of music you can invent and recreate using this awesome mat. It measures 100 inches by 29 inches, which has the added effect of making it possible for 2-3 kids to safely play on it at the same time. Smaller mats don’t really make this possible, just because someone’s foot will end up getting stomped on. Maybe the coolest part of this particular mat is that it comes with a built-in amplifier that you can plug a CD or MP3 directly into. Then, you can play your own music over the amplifier and improvise along with your favorite tunes using the mat. Kids really love this feature – think about it, you can let them help “remix” songs from their favorite movie soundtracks, popular radio songs, and much more. 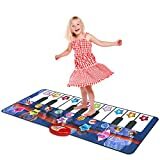 Rhode Island Novelty Giant Electronic Floor Mat Keyboard, Black/White, 100" x 29"
This “Step ‘n Play” setup from Fisher-Price is obviously geared towards very young children, and is much more than “just” a piano mat. In fact, it was awarded the “best 9 to 12 month toy” in 2016. You’ll quickly see why – I’ve purchased this piano mat for several friends with new children, and I’ve yet to see a single kid who wasn’t immediately thrilled by how much musical noise they can make with this thing. As is the common thread with many Fisher-Price toys out there, the entire Step ‘n Play mat is designed to encourage musical interest and skill development through audio and visual stimulation as well as the option to structure how your kid might interact with the mat. On the bottom we have an incredibly soft keyboard for excited tots to trample about on, while they can also bang away on the hand keyboard that’s positioned directly in front of them. On the whole, this is one of the single best piano mats (and overall entertainers) out there for children in the ~9 months to 2 years age range. BigMouth’s “Potty Piano” is a hilarious, unique twist on the classic piano mat. It’s honestly exactly what it sounds like – a piano matt that’s designed to fit around the base of your toilet, so kids (and adults) can pass the time with some jingles while doing their business. The key with any novelty toy like this one is to really commit to it, producing a high quality product that follows through on the premise. BigMouth did exactly that – this toilet mat comes with a helpful song book that teaches you how to play a few simple songs, and is of extremely high quality on the whole. It’s larger than you’d think, louder than you’d think, and just very well-constructed. Get this one for your kids, for yourself, or for that one piano/keyboard player everyone has in their life – none of you will be disappointed! While not quite as big as the Rhode Island Novelty mat, this awesome product from Click N’ Play is another large-scale, well-done piano mat. It measures in at 70 inches by 29 inches, and comes with 24 full piano keys, 4 modes (play, record, playback, and demo), 8 instrument sounds (guitar, piano, clarinet, saxophone, violin, trumpet, xylophone, and banjo), adjustable volume, and an automatic shutdown system that ensure you won’t accidentally burn through batteries when your kids inevitably leave it on. The thing that really stood out to me with this one is how durable it is. It’s made with a very thick vinyl material, and it will definitely stand up to the heavy abuse kids tend to inflict on toys like this. The sound, too, is surprisingly loud for a product like this – manufacturers usually skimp on things like audio quality (because what kid will notice or complain about audio quality) in order to keep the price down, but Click N’ Play seems to have maintained a very reasonable level of volume and audio quality for an extremely affordable price. Why Should You Buy a Piano Mat? Good question. While it is mostly a novelty item, that does not take away from the fact that it is quite entertaining and a nifty addition to your home. For children, having a mini piano mat for them to play with can be a great incentive for them to take up piano lessons. Plus, tapping away at the mat is also a nice and distracting way to get some exercise for both adults and kids. Plus, for performers, this can be a great addition to their set. A little fun half-time break if you will. It can also be used for your kid’s birthday party. Piano mats have become increasingly popular and you might also be familiar with one variation of the piano mat which is the rhythm arcade games like the “Dance, Dance Revolution” franchise. This arcade game which blew up in popularity during the 2000’s was so clearly inspired by dancing mats but with a new spin to the classic novelty toy. The piano mat was designed not only for music lovers but also for children and adults who just simply want to have some fun. If you are planning on getting a piano mat for you or kid then there are certain features that you need to learn first so that you will be able to get the best possible one available. Piano mats is actually a great music educational tool for young ones. They will be able to experiment with sounds while also being physically active which is another noteworthy benefit. Size should be around 60-inches by 24-inches. This is the standard size for a children’s piano mat. You can choose something larger than this if you wish. It should include additional modes like play, demo mode, record, and playback. Some will have several demo songs already pre-recorded. This help in teaching your kid some tunes. Some piano mats allow you to change the instrument sound to other than that of a piano. You can choose to use a guitar, trumpet, violin, sax, banjo, and clarinet among others. This should allow you and your child some more freedom when experimenting with musical notes. It should have an auto-shutdown feature that will force the piano mat to turn off if left unattended for a set amount of time. This should help you conserve the battery life of the mat. There should also be an adjustable volume control. There are cheap ones that are permanently set to a specific volume level. Sometimes this level is too loud that the music comes out jagged while there are times when it is too low which is not a good thing if you plan on using it in parties. Most piano mats use batteries. Common one utilizes 3x AAA batteries while others use AA batteries. If you can get one that has a rechargeable power source then I recommend you get that one. This one is extremely safe to use and anyone can play the piano mat. The recommended age for the piano mat is 3 and up. Basically, once your child is able to stand on his own then he or she can play and enjoy the piano mat. One other thing that makes the piano mat a worthwhile investment is that while other toys will most likely fall by the wayside as your kids grow up, the piano mat has no age limit. Heck, even parents will enjoy playing around with this unique instrument from time to time. The obvious benefits of having a piano mat for your kid’s centers around educational and physical. But let’s get more specific with the advantages your child can get if they have a piano mat of their own. First off is the physical benefit of improving their coordination and motor skills. Piano mats will require you to be quick on your feet and hop around accurately to each tile. This can help your kid develop their balance and stability. As stated earlier, you can change the sound coming out of the piano mat with a push of a button. This can be a great introduction to the various musical instruments for your child. It can help develop their creativity. The piano mat promotes experimentation and the playback feature can help fuel you child’s creativity in making music. The piano mat can be a fun little addition to your children’s educational set of toys. There are even larger ones designed for adult use. Not only can it be a great educational tool for young ones, it can also be used in parties as well. Piano mats also encourage the user to be active which lends a hand in physical fitness. If you are looking for a nice little novelty item that is more than one trick pony then you might want to take a look at piano mats. As a children’s toy it is able to deliver several benefits to the kid. Simply put, having a piano mat is a win-win situation.